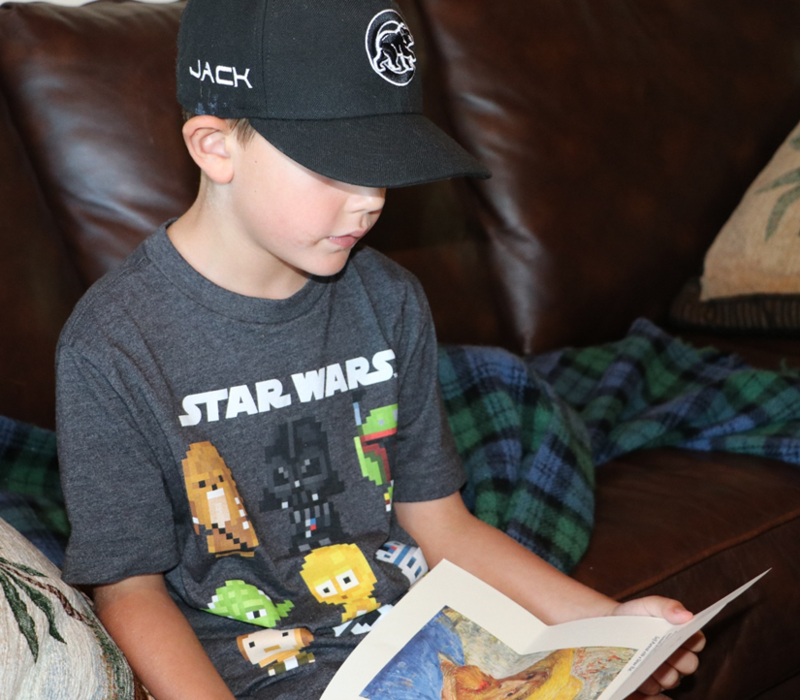 Jack and Owen celebrated their birthdays at Casa La Mancha, which they call Papa’s Place on the Lake. Jack received a roll of quarters and folder for them from Thomas Jefferson. Along with the quarters and folder, he received a signed birthday greeting from Jefferson. 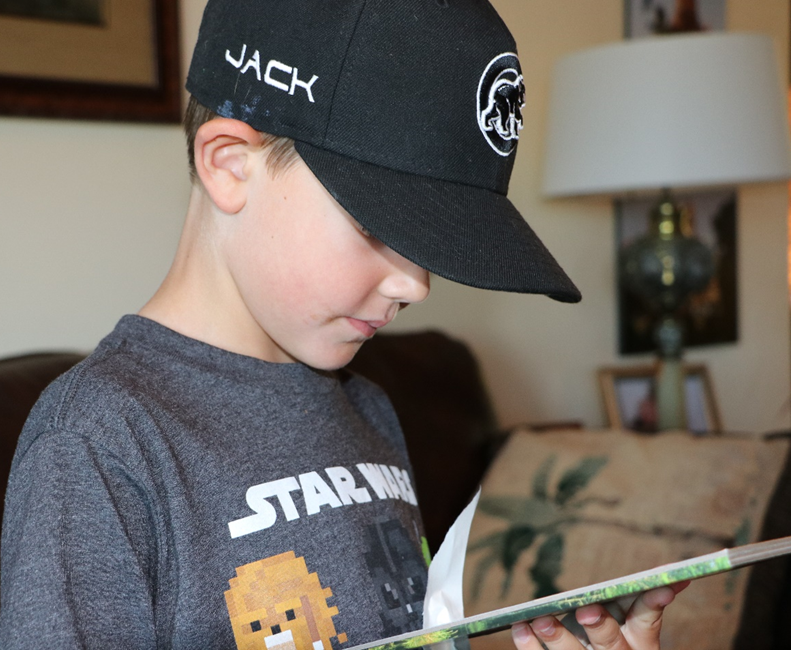 Jack also got a couple fossils from Charles Darwin for his fossil collection, a birthday greeting, and an explanation of the fossils. 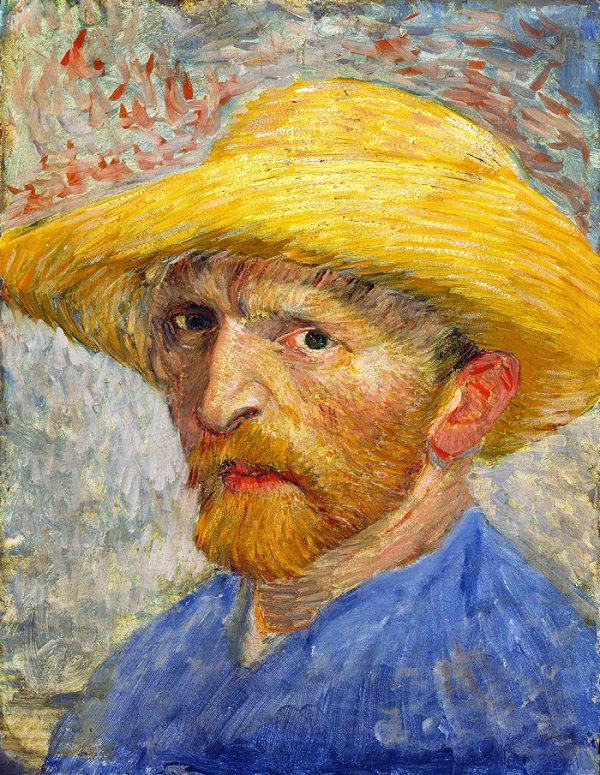 Another gift was from Vincent van Gogh of the painting, Self-Portrait with a Straw Hat, along with a letter from Vincent with his wish of a Happy 7th Birthday. 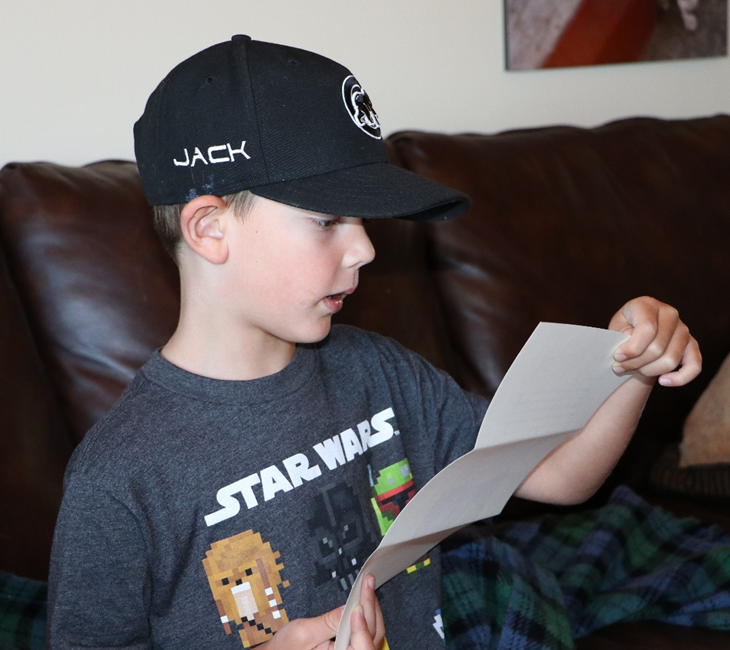 Finally, Jack received a letter from Ben Rotteveel. He and Pete, his brother, own Dutch Grown, which imports Dutch bulbs from Holland. Ben will send Jack and Owen some tulip bulbs like the ones in Holland where van Gogh lived. I have written to you about Impressionism before. When I paint, I paint my first impression of a scene or of a person. When I was in Paris, I wanted to paint people but couldn’t pay them to sit while I painted them. So, guess what I did? I bought a mirror and held it up, looked at myself, and then painted two dozen self-portraits of what I saw. This one is called Self-Portrait with a Straw Hat. What colors do you see in this painting? I know you and your papa like blues and yellows. 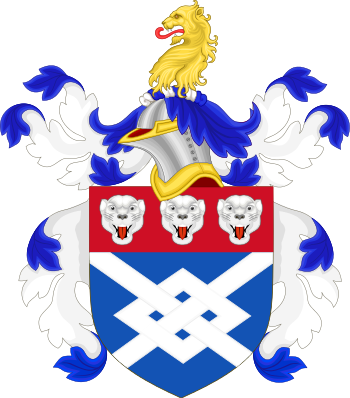 Do you know that his dog, Ginger and other dogs can only see two colors, which are also blues and yellows? I was visiting him a couple weeks ago, and he showed me your artwork on his office wall. You are good at many levels. For example, you know dozens of famous paintings and who painted them. Additionally, you can draw, paint, and color. Your papa is proud of you, and so am I. So, young man, Happy Birthday and paint on. You have great talent. 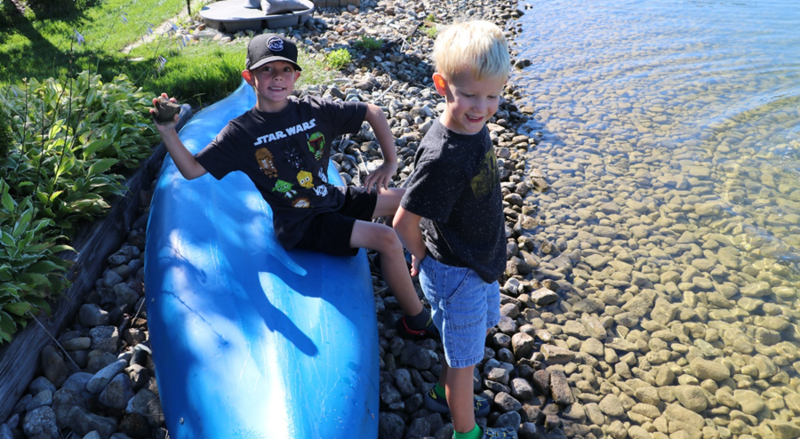 The reason that you and Owen get fossils from me is because you found a fossil in your papa’s home on the lake while throwing rocks in the lake. The rock contained some fossilized seashells. Your papa took geology many years ago while in college, which seems like it was during the Jurassic period. He hasn’t forgotten too much from those college days in geology class. I’m sending you a pair of brachiopods, which date back 500 million years. 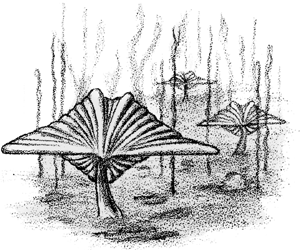 What is interesting about brachiopods is that they look like little trees growing on the ocean floor. I drew this picture of what they looked like. The other fossil is called an orthoceras, which I found in Morocco. It is another seashell and was the precursor of the chambered nautilus. It dates back 350-million years ago. I gave Owen a similar fossil. However, the two of them are different colors due to what the seabed contained like minerals, which caused the fossils to have different colors. So, on your seventh birthday, I hope that you enjoy discovering. Your papa says that you ask why a great deal. Young man, never give up that talent and trait. Ask, ask, and ask again. If you do, you will remain a very smart student. Our country is celebrating 241-years of independence from England, and you are celebrating your 7th birthday. I tip my hat to America and to you...carry on. Your papa told me that you are collecting famous paintings, fossils, and coins. Therefore, I decided that you should start a collection of quarters upon which you can see my profile. On the reverse side of the quarter are historic sites from all the States. We started out with 13-States, and now we have 50. Your papa tells me that you collect fossils, coins, and famous paintings. You seem like you like a variety of artists like Chagall, Monet, El Greco, and van Gogh. I also hear that van Gogh sent you his painting, Man in a Straw Hat, for your birthday. Your papa and I are friends. Did he tell you about spending summers on the farm of his cousins in Oxford, PA when he was your age? That is not far from where I live. I sell bulbs...millions of bulbs, which make beautiful flowerbeds. I’m sending you some tulip bulbs that came from Holland. They will arrive in a couple of months. In the spring, you will enjoy them. 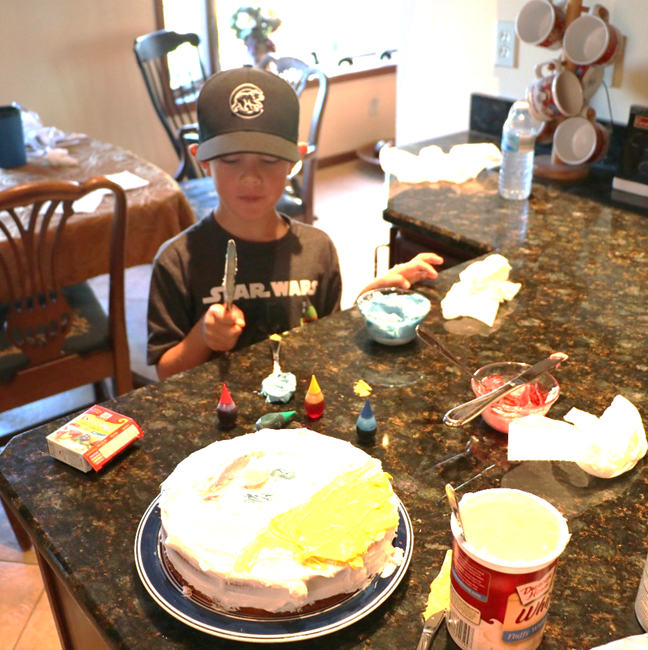 Jack is decorating his cake like van Gogh’s painting. Then down to the lake where Jack found another fossil.